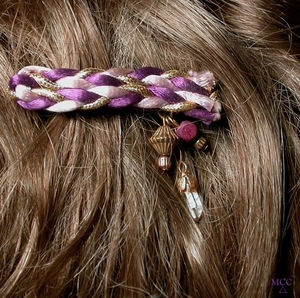 Violet, color of royalty...lilac and gold are braided above a tassel of rock crystal, purple wood and golden beads...all secured onto a medium French clip barrette [2-1/2"]. Puts some extra energy right at the top of you! Sent gift boxed with handwritten description on the reverse of our enclosure card. Please write ahead if you'd like more than one. Shipping will be added.